How do I make tie dye with a group of children? How do I dye my stained couch covers? Are you looking for ready-made tie dye to buy? Are you making tie dyed garments to sell using our products? Start with the right information and get great results right from the start. ...at a time that does not suit me." ...at any time that suits you. I made a new tutorial video for all of you this week. Here is the technique you can use to dye a heart. How do I buy Slipstream Dye? If you are in a hurry and would like to buy something off the shelf, click on the button that says "Stockists" at the top of this page and you will find the national list of stores that carries our products. For Special Offers, click on the button at the top of this page that says "Special Offers" and you will find the current selection. Is it a Hot or a Cold fabric dye? Slipstream Fabric dye gives the best results at 65-70 degrees Celsius. Over past years I have taught thousands of people how to dye and print their own fabrics by hand. The cost of travel is high and I often only have a handful of interested people in any place, so I found a way to make my courses available online so that I can reach my students anywhere in the world, at any time of the day or night, at a price we can both afford. The online courses are a blended experience of video and reading with plenty of clear pictures and explanations. The learning platform is interactive. If there is anything you do not understand in the course, you simply ask your questions on the course feedback forms and I will answer them in person. Thanks to the marvel of modern technology, I now have students all around the world, including Europe, North and South America, Australia, New Zealand and Russia. I have also created different ways of learning from me, depending on your learning style and budget. You can sign up for the online courses and eBooks if you want to learn something specific at any time. You choose the topic of your choice and sign up when you are ready. If you prefer to pay a small monthly subscription, I have also created an online school on Patreon. For a monthly contribution you learn something from me every day on the exclusive learning feed. Patrons on this platform receive daily learning and discounts on courses and eBooks. Sign up and learn how to create your own designs and prints, in the colors that you want, when you need them, and on a shoestring budget. Are you looking for more information about techniques for different patterns and ways of using the dye? Between 2002-2008 I manufactured hundreds of dip dyed items for the South African fashion industry for brands like Sun Goddess and Stoned Cherrie. Later I went on to teach the technique i scores of workshops around Southern Africa. There is an easy way and a difficult way to achieve this finish. The different techniques have different benefits and drawbacks. I have written down all of my knowledge about the process in an eBook that you can use to assess which method is best suited to your specific purposes. Do you need the finish to be wash fast? Do all of your curtains need to look exactly the same? Are you making it for somebody else? Do you want a dip dyed wedding dress? This eBook will answer all of your questions about the process. A favorite Box Kit of forest fairies... This color combination of cool greens with navy and purple for accents, is a favorite color combination among our customers. Click through to the Special Offers for the Tsitsikama special until 23 February. You can make these colors using a Rainbow Box Kit. Would YOU like to make one of these? Would YOU like to try making something like this? Any 100% cotton fabric will work. Perhaps you have some old stained sheets that need a face lift? If you are interested in extra tutorials and video, Melanie shares all of her secrets with her Patrons on Patreon. Learn from Melanie in person on Patreon, from as little as $1USD a month. The more you spend, the more you get. Click through to this link to become a Patron and start learning more about dyeing and printing cloth from somebody with twenty four years of experience making decorative textiles. "Melanie, I want to make tie dyed T-shirts for Christmas gifts." We recommend that you start by watching this FREE video so you can get an idea of what the activity entails. This is a fail-safe technique. If you stick to the suggestions in the video, you should get a happy result. Thousands of people have achieved great results using this video. This online course is on an automated platform that you can access at any time of the day or night, from anywhere in the world. No waiting for our office to get back to you with information that you need in a hurry. Once you have worked your way through the information you will also have a better understanding of what you will need. Purchasing the tie dye kits... If you use the technique in the video you can get up to 30 kids T-shirts from a Rainbow Box or other Box Of 3 color combination. This is the same kit that we use in the video and the colors will mix rainbows. If you use the technique in the video, you can get up to 50 kids T-shirts from a Box Of 5. Select a pre-packed color set that you like. Purchasing the T-shirts... Click through to the link below to download the entire list of suppliers that we have used over the years. This is a FREE resource. I hope that this helps you to plan how you will make your rainbow gifts this year? Can I re-use Slipstream Fabric Dye once I have mixed in all of the chemicals? How much fabric can you dye with 250g Bulk Dye? "How much fabric can I dye with 250g of your dye?" How much chemical you use will depend on the specific technique and fabric used. We recommend that you sample your technique and fabric for your specific purpose and work it out from there. For example, if you mix the dye and dip the fabric in the color, you might get 200 T-shirts from the 250g pack. If you are doing ice dyeing, you might only get 20 if you like to use a lot of powder to achieve your specific effects. Different effects use vastly different quantities of chemical, so your choice of technique will determine how much you will use. The techniques that we usually recommend for beginners use less dye than the ice dyeing techniques that are currently fashionable. Different size washing machines with different volumes and cycles will use different quantities. You will have to sample your fabric in your machine to get your specific quantities. We have created a Facebook community where our students can show off what they have made. We often get inquiries from visitors to this website who are looking for ready made T-shirts and not the kits. If you post the garments and products that you are making for sale in this group, we can send these people directly there to choose what they would like from your selection. In this way we grow the customers who support our brand. If you are somebody who is looking for ready made tie dyed T-shirts and not self-help kits, please click through to the link above to view the selection there. Carol Tebbutt is our stockist in Durban. She has been working with our products for many years and she can help you with your Slipstream Box Kits in Durban. Carol does not have a brick and mortar store. Contact her on her cell number and make an appointment to collect what you need from her. Her cell number is 0829217360. Many of our customers make and sell handmade textile items. They make extra money that goes towards school fees, food and other gaps that salaries do not cover. Many of you contact us and ask us to make your tie dyed items for you. Please support our customers who buy from us. They will do a happy dance if you buy from them. The product works best in suspension. This means that you are working with liquids. If you want something sticky to paint on to fabric that is an opaque block-out, you need to find a fabric paint. Fabric dye is a wet mixture, often applied in a pot. If the dye does not reach 65-70 degrees ON THE FABRIC for long enough, you will get variable results. We recommend an hour of heat if possible for best results. Flash heating in the microwave oven also works well. For more information about these techniques, refer to one of our eBooks or order the Dyecraft video. For maximum wash fastness, leave the colour on the fabric for 24 hours before washing off the excess chemicals. If you do not want the colour to fade, give it a chance to bind properly with the cloth. Are you looking for a way to entertain a group of children? Many of you have commented on the cotton knit dresses that I wear when I teach. I buy them ready-made in cream from Rheola's in Harrismith. Rheola runs a Skills Development Center called Tsa Lapeng, where she teaches rural women handcrafting skills that they can use to be self-reliant. They manufacture quality knitwear made from natural fibers, sourced locally. They specialize in 100% cotton and cotton/bamboo blends. They make jerseys, dresses, shawls and beanies. The shawls are by far my favorite and I always have one draped around my shoulders in chilly weather. Contact Rheola directly for pricing on 058 623 1521 or 083 334 2724, or click through to her Facebook page below to see more of their products. I have taught there a few times and I always enjoy it very much. Here is the color chart that the ladies at the center created after one of their training sessions. If you would like to learn how to create your own color chart of recipes like the one in the image above, sign up for the online course today and work in your own home in your own time to make this useful reference tool for manufacturers. Many of you who are new are just busting with questions. While we try our best to answer them here with my eBooks, many of you want free resources that you can refer to to answer your specific technical questions. Paula Burch has done just this on her incredible website. It is a mine of information and she has taken the time to answer every conceivable question about dye in detail for you. My network sends me links and images to interesting things that I might like on Facebook. This week I was sent an image more than ten times by different people. The dress is certainly breathtaking and it captured the imagination of the world, sweeping across the social networks like a wave. There were also a great number of people who spoke about trying to copy it or trying to order a copy from somebody else. Once again illustrating how incomplete the general understanding is about Copyright. If you were in the shoes of the Maker, how would YOU feel to hear these conversations? This is a great way of figuring out whether you are doing something ethical or unethical when using another work for inspiration. Put yourself in the shoes of the person who made the original work. Ask yourself, "How would I feel if I made this creative work and saw somebody else copying it in this way? What Does It Cost To Hire Top Talent In Fiber Art? This is the question that Abby Franquemont answers in concise detail in this fantastic blog. Click through to the link and have a read if you would like to know what the industry unit standard is currently. I was quite delighted when I found this article. In today's difficult financial times, I am bombarded with people who say "Your workshops are too expensive for me." This article explains the REAL costs to teachers and venues of running workshops for people. As a Fiber Artist who has worked extensively for the local Fashion Industry and who has published two books with editions in South Africa, USA, Canada and Russia, I still often get requests from people who ask for workshops and then ask "Do I have to pay?" As a professional who has made a living in Fiber Arts for more than twenty years, I deserve to charge for my time and expertise just as any other professional does. The common perception, when we dig deeper, seems to be that Creatives work for Love, not money, and that that should be good enough for us. It is very difficult to continue loving something, when pursuing it excludes you financially from so many things that "other people" seem to be doing with their financial resources like pay rent, food, medical, education, savings and a pension. If you spend a lifetime on the outside looking in at that while you doggedly persist with the work that you thought you loved in the beginning, you do not love that work in the end. You might go to your grave with bitterness for the very thing that you Loved because you feel that you wasted years chasing a dream that was not real. Creatives must be respected financially in the same way that any other professional at the top of their game is. Almost every week I get an inquirey from somebody looking for a natural dye that they can use to manufacture a more environmentally friendly product. The issue may not be quite as simple as that. Let us compare the two to figure out the real story. Chemicals are mined from the earth and synthesized into man made dyestuffs. Natural dyes are made from natural materials, gathered from the environment, such as lichen and bark. Ten grams of man made dye powder can dye 250 grams of fabric to a vibrant shade, every time, if used correctly. Natural dyestuffs will have variable shades. Vibrancy depends on the potency of the raw materials. As much as two kilograms of raw material is needed to produce very dark colours on 250 grams of fabric. Man made dyes result in the same colour every time if used correctly. It is possible to get an exact colour match using these chemicals. Natural dyes will give you varying colours, every time. Colour changes with the potency of the raw materials. This is governed by climate, soil and plant dna. Heavy metals in certain man made colours, fixatives and other chemicals used in the process put a burden on the environment and the health of the people working with them daily. Mordants used to fix natural dyes will have exactly the same effect if you create enough waste and do not dispose of it in a responsible fashion. Man made dyes are robust and colour fast over many washes of they have been used correctly. Natural dyes will fade over time. People often assume that if they can find a natural dye, they are free of the guilt that they might feel about polluting the environment with their commerce. The truth is, no human activity is without its footprint. In fact, the dye is only part of the problem. What about the fabric that you are about to dye? Was it produced with organically grown cotton that has not been genetically modified? Were the workers on the farm treated fairly or were they children? Was water used responsibly throughout all stages? Was the fibre scoured with chlorine in the mill? Chlorine is one of the most damaging chemicals out there. With so many things to consider, finding a natural dyestuff is not the quick-fix you might be hoping for. What Do I Do If I Spill Bleach On My Trousers? As a dye specialist, this is the most common question that I am asked by people. I do not have a simple answer for this challenge. Dye is translucent, not opaque. This means that the light actually passes through the colour and reflects off the white fabric behind it. Dye is see-through. When working with it, imagine working with sheets of coloured transparency film with light shining from behind. It is this quality that leads to such vibrant results when experimenting with dyed techniques. It means that the base cloth can be seen through subsequent layers of dye. If the base is uneven, the next layer will also appear uneven. It is very difficult to cover bleach marks. You will have to completely saturate the fibre to get rid of the mark. The lighter marks may reappear later in subsequent washes as the fabric fades again. Those particular fibres will always have less dye on them than those that were not bleached. Bleach is very destructive, and if you did not wash it out thoroughly just after the spill happened, it is likely to damage the fibre. A fibre that has been softened in this way may not hold dye very well either. This further reduces your chances of solving the problem. If the spill is large and the “koki-treatment” just too tacky, I simply go with the flow. I go outside to the hosepipe with the garment, the bottle of bleach, a syringe and some rubber gloves. I put on the rubber gloves, draw some bleach into the syringe and squirt it all over the garment to create an artistic dripped effect. As soon as I see the marks I want emerging, I spray the fabric off with the hosepipe to slow down the reaction. Do not stand too close to such a project. The chlorine gas released by the reaction smells bad and can make you very ill. Try not to breathe in the fumes and wear a face mask if you have one. I have created some fabulous “designer” garments for myself from some of my clumsier moments. Wash the fabric thoroughly to remove all the bleach. How many washes will depend on how strong the bleach was that you used. When you can no longer smell it, you can stop washing. If you leave traces of bleach in the fabric, it will weaken the fibre and you can expect the garment to tear. Good luck with your spill. What is the difference between a Hot and a Cold reactive dye? One would think it is quite obvious; the one is used with hot water and the other with cold. Almost every commercial dye available is labelled this way. Unfortunately, for the consumer who buys this product, this labeling is a little misleading. A Hot reactive dye requires boiling at one hundred degrees Celsius for the bond with the fabric to be permanent. A Cold reactive dye does not need to be boiled, but its optimum temperature is still sixty five to seventy degrees. If you measure this heat with a thermometer, you will see that it is still steaming hot. I have burned blisters on my skin at that temperature. The other misconception that people have is that they assume the Hot dye is more colour-fast than the Cold one because you have boiled the colour in. This is not so. Cold dyes are more robust and colours will remain brighter for longer than Hot dyes. The cooler process is not only a little easier, it is also more lasting. Cold reactive dyes are very reliable and used throughout the global clothing and textile industries to permanently colour fabrics made from plant fibres. The dyes react with the fibre on a molecular level to produce a permanent bond that withstands wash after wash. The colour becomes part of the fabric. A Cold reactive dye is, in my opinion, the most convenient by far for the hobby dyer. It can be used to dye any fabric that starts out as a plant, i.e. cotton, linen, hemp and bamboo. Any fabrics with these bases will bond with reactive dye, e.g. denim, twill, calico, muslin, T-shirting, toweling, corduroy, cotton velvet, viscose, track suiting, poplin and cheesecloth. Cotton/lycra and viscose/lycra blends also work well, providing the lycra content is under five percent. Reactive dye does not bond to lycra. Poly/cotton blends will only take the dye partially. The cotton fibres that run in one direction will take up the dye normally, but the polyester fibres that run in the other direction will remain white. Because these dyes are used at high temperatures, expect your fabric to shrink. The fabric is woven on a loom in the factory, where it takes its dimensions from the equipment. From there it is usually put through a stent which steams the fabric into the desired dimensions for shipping. Sometimes there are variances in fabrics that come off the same equipment. Research has shown that such variances are caused by differences in the cotton fibres used. A fabric made from a crop that has had more water will behave differently from one that had less water in the field. Fabric stability is fibre-specific and will vary from one roll to the next. Most cotton fabrics shrink about ten percent in the length. The width is usually stable to within one or two percent. Why kids of ALL AGES love tie dye! * They have to dress up to do it…We recommend kids kit up with mask and apron to make tie dye. This will protect their clothes from spills that stain. By far their favourite is the latex gloves they have to put on to keep their hands clean. I am told they make for very good water bombs when you are ten years old. * It gets messy! Most kids enjoy activities that are messy…of course!? * They play with color. Most children love to play with bright colors. Color is known to stimulate the brain in a number of ways. * They work with their hands. 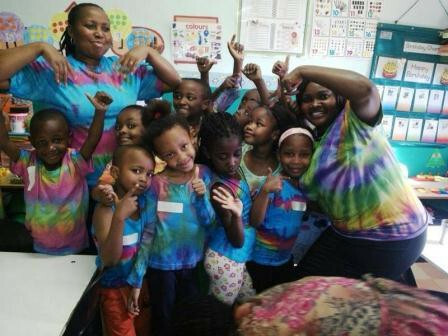 Tie dye improves strength and fine motor co-ordination in the hands. Children are forced to work with both hands using string and elastic bands. * They have to follow a set of instructions from beginning to end, in order to achieve a desired result. This teaches children to read, concentrate, think logically and analyse their results. All skills they can use in later life. * It gives them a sense of achievement and self-worth. Having successfully made something on their own fills a child with a great sense of pride which leads to more confidence in their own abilities. * Tie dye lends itself to self-expression and uniqueness. Children learn about uniqueness and the beauty of a hand-made thing. These are old-fashioned values that have been lost in our mass produced society. * The Wow Moment! Kids love the moment when the bindings come off and the end result is finally revealed. I call it the Wow Moment. After more than tweny years, I still experience it every time I open a new tie dye. * They get to wear what they have made. Kids get an even bigger boost to their confidence when they are praised for work well done. Every time they wear their tie dye, somebody will tell them how beautiful it is, or ask where they got it. * Conclusion…tie dye is a kids-confidence-builder…and it is fun!